On March 1st, I'll be participating in a full-day master workshop in Montreal called "Leading Creative Teams for Productivity, Innovation, and Happiness" with Christopher Avery, Jason Della Rocca and Scott Crabtree. My part will be describing how creative teams, which have been shown to be the most productive when intrinsically motivated, can have effective leadership. Agile frameworks emphasize "people over process"; treating people not as machines on an assembly line, but as individuals motivated by autonomy, mastery and purpose. These motivations cannot be commanded. They must be cultivated. This leads to a useful metaphor to me, that a good leader of creative people is more like a gardener than a process mechanic. A gardener cannot force a tree to grow. They nurture it's growth. In this metaphor, the roots are the intrinsic motivations. Leaders cannot change these. They cannot be forced. They are beneath the ground: always there. The trunk is the organization's culture. Like a tree's trunk, this cannot be pruned or changed, overnight. Some cultures are weak and will not support good growth. Some are strong; enriched from the start and will provide connection between motivated people and the fruits of what they build. The branches are process and systems. 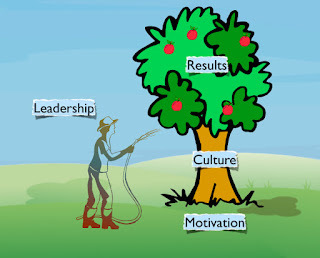 These result from the culture, but are also directly manipulated by the leader. Unchecked, process can grow into an unwieldy tangle of practices that sap the productivity, motivation and passion of developers. Gardeners cannot force proper growth. Most of what they do is subtractive (pruning, weeding, etc) and indirect (there's got to be many good fertilizer jokes here). The actual growth results not from the gardener, but nature. This is where the concept of self-organization and complex adaptive systems come in. Like all other organisms, human organizations are complex adaptive systems. We self-organize constantly, and mostly unconsciously. We respond to processes, system, and rules in complex, often surprising ways. This is why there are not hit game factories and it should be no surprise that the studio that is the closest to pumping out hit games like widgets off an assembly line embraces self-organization. So if you are in Montreal on March 1st, please join us to explore how leadership, innovation, happiness and productivity can all grow together.